Instruments from the Roman Teller workshop (which include the Rudolf Buchner instruments), especially those from before 1974 when Teller died, have become popular with our customers. These instruments represent an above average quality for a commercial German instrument. 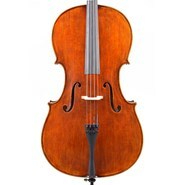 This cello has an excellent tone quality and is in exceptional condition. The elegant style of Vuillaume’s instruments has inspired us to create a new model in his honor. Using European wood, the violins are based on his Guarneri model violin, the cello on his Strad pattern. The varnish imitates his unique lustrous golden hue. The tone is powerful, easily producing colors from the entire spectrum. See www.jayhaide.com for further information on our Jay Haide instruments. 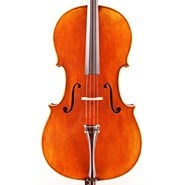 This special model represents an excellent alternative to our regular European wood cellos. The European wood used for this model was chosen for its tonal qualities and is offered at an ideal price point. The cellos project with rich warmth and great power. We are currently offering the S model in Strad, Montagnana, and Ruggeri patterns.